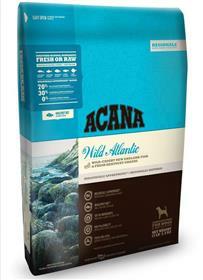 Delivered fresh, in WholePrey ratios, so they’re brimming with goodness, ACANA’s rich diversity of saltwater fish mirror your dog’s evolutionary diet, nourishing peak health without long lists of synthetic supplements and additives. Prepared in our Kentucky DogStar kitchens from America’s best and freshest ingredients, ACANA Wild Atlantic is guaranteed to keep your dog healthy, happy and strong. Our award-winning Biologically Appropriate philosophy is simple: mirror the quantity, freshness and variety of meats that dogs are evolved to eat, while limiting the carbohydrates and synthetic ingredients that don’t belong in your dog’s natural diet. Ingredients:Whole mackerel*, whole herring*, whole redfish*, silver hake*, mackerel meal, herring meal, whole green peas, red lentils, pinto beans, pollock meal, cod meal, catfish oil, chickpeas, green lentils, whole yellow peas, herring oil, sun-cured alfalfa, yellowtail flounder*, natural fish flavor, sunflower oil, dried kelp, freeze-dried cod liver, whole pumpkin*, whole butternut squash*, kale*, spinach*, mustard greens*, collard greens*, turnip greens*, carrots*, *Red Delicious apples, *Bartlett pears, pumpkin seeds, sunflower seeds, zinc proteinate, copper proteinate, mixed tocopherols (preservative), chicory root, turmeric, sarsaparilla root, althea root, rosehips, juniper berries, dried lactobacillus acidophilus fermentation product, dried bifidobacterium animalis fermentation product, dried lactobacillus casei fermentation product.